Lunch is provided. Please register here! Join Stephen P. McCormick to learn more about his Huon d’Auvergne project and his work with DH students! McCormick will speak on his research and work with the digital and facsimile edition of Huon d’Auvergne, a pre-modern Franco-Italian epic. 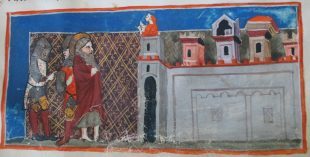 Linking institutions and disciplines, the Huon d’Auvergne Digital Archive is a collaborative scholarly project that presents for the first time to a modern reading audience the Franco-Italian Huon d’Auvergne romance epic. This talk is sponsored by the Medieval and Renaissance Studies Program and the Digital Humanities Cohort.